Meet Dexter, Mary Poppins of the pooch world! Dexter the wonder dog developed a knack for playing nanny when he was just a baby himself. He spent the first year of his life living with a single dad and his two young children, and quickly put himself to work protecting the toddlers from the dangers beyond the broken front gate. On a few occasions, a local foster carer spotted the toddlers walking down the middle of the main street, and saw Dexter shoot out into the road and usher the children safely back onto the footpath. Sadly, Dexter was often on the loose by himself, and regularly picked up by the local rangers. When faced with an impounding fee, Dexter’s owner was unable to pay and had to surrender the dog. “Dexter was not going to be put to sleep, if anyone could help it,” says Heather from YP Puppy Rescue. “We didn't hesitate to rescue this boy. And after hearing about his natural guardianship skills, I was really keen to find a home where his love for children would be appreciated. “There had been a few people on Facebook looking for very special dogs for children with autism, and I had a feeling we had the right dog, right here!” Heather smiles. Then, bingo! 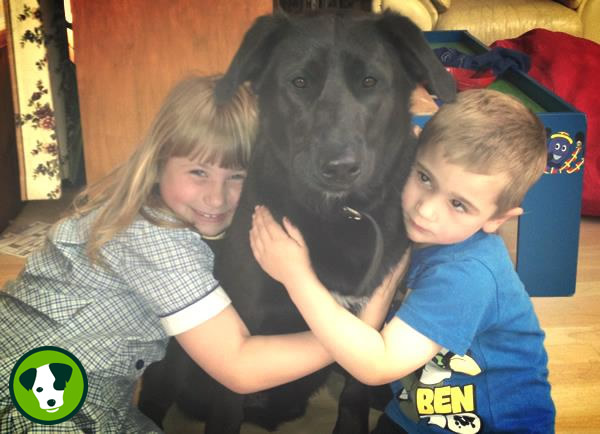 A family with a large property and two autistic children enquired about Dexter through the PetRescue website, and the team at YP Puppy Rescue prayed that Dexter would prove to be as wonderful as he’d promised to be. “We had been searching for quite some time to find the right dog for our two autistic children. My youngest boy would scream at the sight of larger dogs approaching and wanted a cute puppy, so we never considered a bigger, fully-grown dog,” says Veronica – Mum of two and now the proud owner of Dexter the Labrador-cross. After one week, Heather at YP Puppy Rescue called the family, and what they had to tell her was truly mind-blowing. Dexter immediately took on the role of guardian for his new young family. While out walking on the property, Dexter and the kids encountered a workman clearing some bushes, but before the kids could reach the stranger, Dexter placed himself in the middle and growled at the man. As soon as Mum let Dexter know everything was OK, the dog stood down. All this happened within the first week of being in his new home. “After our two week trial, I asked the children, ‘Do we give Dexter back now?’ And two very sad faces replied ‘No way! We love him mummy. We are keeping him!’ As parents, we love him too. “Dexter is a true blessing to our family. He is the guardian angel who watches over my children. He is the playmate who keeps my son entertained, playing ball and tug-o-war. He is the hairdressing model who sits still while my daughter brushes his hair and dresses him up. He is the home help who gets the kids up out of bed in the morning. He is the saviour to a very tired mum and dad after a hectic day. “I’ve noticed a huge change in the mood and temperament of the children. There are fewer meltdowns and a lot more laughs and giggles. I trust this dog impeccably – something I would never have said about a big dog before,” says Veronica. “I also have great trust in dog rescues. YP Puppy’s temperament-screening process was very thorough and carried out by a fully qualified dog trainer to ensure the right companion was placed with our family. And once we brought Dexter home, they touched base to see how we were doing and offered the advice we needed to help Dexter fit in. Their door is always open. “That’s something you rarely find at pet shops and breeders. I truly thank PetRescue and YP Puppy for making it such a positive experience to find a new companion. “Anyone who has not considered adopting an adult dog, please do. These beautiful dogs are not broken or sad. They are wonderful beings who are just waiting for the right family to love them,” says Veronica. Find your new best friend online today! If reading this Happy Tail inspired you to consider adopting, we have thousands of adorable pets waiting for their forever homes right now. You can help us keep saving pets too, by making a donation to our rehoming programs. It costs just $10 to match one of our rescue pets with their new family.